Red-breasted Merganser males. Specializing in fish and crustaceans, these diving ducks have serrated bills for efficient hunting. While many female duck species tend to wear more subtle, cryptic plumage year-round, male ducks–called drakes–are in their finest breeding (or alternate) plumage through the late fall and winter, best seen in the early morning or late afternoon sunshine. The feathers of some drakes can light up with multicoloured iridescence that looks dull or black under overcast skies. The ubiquitous Mallard gets short shrift much of the time, but it is undeniably attractive (they think so too). Greater Scaup drake with a mouthful of clams. A Hooded Merganser drake grasps its fishy meal with a serrated bill. Grebes, another type of waterfowl seen in winter, share lobed toes with the coots, but they have no close avian relatives. With legs situated far to the rear of their bodies, these birds are barely able to walk on land. Red-necked Grebes, which nest in Col. Sam Smith Park and Humber Bay Park East, often linger into November and begin returning in late February. The pairs return to their usual territories–nests of sticks and vegetation built on floating wooden platforms provided by supporters to encourage breeding–already singing their raucous songs of love and challenge. Red-necked Grebe pair in courtship,. March. One more species, the petite Pied-billed Grebes can be found in the open water of harbours and bays in the winter. EPied-billed Grebe in non-breeding (basic) plumage, Humber Bay, late January. Eared Grebe in winter plumage, January. Canada Geese now overwinter along the lake shore parks in great numbers, similar to Mallards, no doubt aided by overfeeding and the proliferation of grassy lawns. They tend to be somewhat overlooked, but when a large flock is stretched out in a long “V” across the sky and bugling loudly, they are hard to ignore. 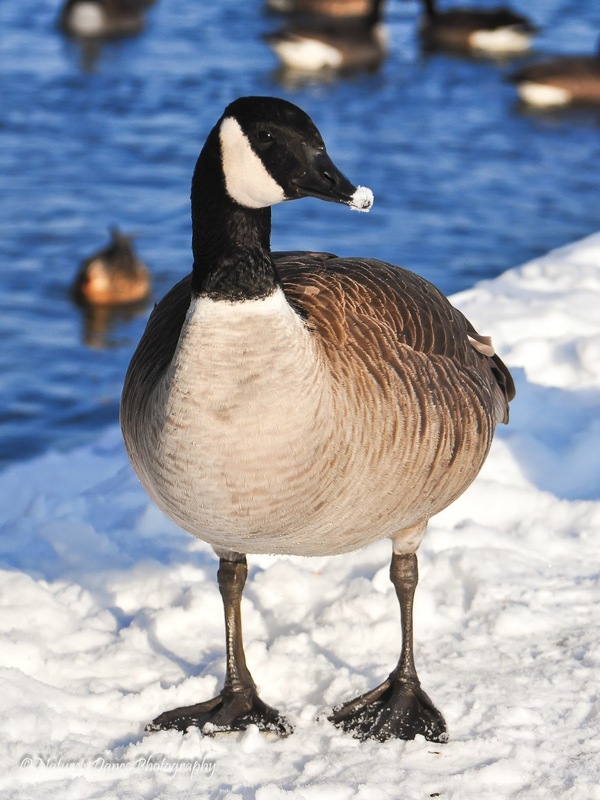 There are several subspecies of Canada Geese ranging across Canada, with the smallest now recognized as a different species – The Cackling Goose. Our other native swan species, the Tundra Swan, begins to migrate back toward the Arctic tundra in February-March, “staging” in large numbers around the northern Lake Erie bays, marshes and fields, and are occasionally spotted here in our parks. Tundra Swans usually show a yellow spot on the facial skin and hold their necks straight (not apparent in this preening bird), Col. Sam Smith Park, March. 2012. Introduced Mute Swans have bright-orange bills and carry their necks in an elegant S-shape. This cob (male) is already displaying in January. An immature male Harlequin duck hanging out with his Redhead pals, 2016. Much less commonly reported, but a species that seems to have had an affinity for the west Toronto shores in the past, is the Western Grebe. Strictly a western bird, it does rarely wander far off course–to thrill many admirers. Although they are much more expected annually than the rarities above, some of the following species are always nice to see on a winter’s outing along the lake. I have a friend or two who think that ducks and other waterfowl are (yaawwwn) boring. True enough, when peering at distant rafts of indistinguishable ducks out on the lake on a cold, grey day, then maybe they can be boring. But, every once in a while, conditions are just right for an up-close and personal–and very unboring– look at some very brightlycoloured birds in an otherwise stark winter landscape. This article originally appeared on the Friends of Sam Smith Park website. Gadwall drake preening after a bath. This truly is a season of change…suddenly, large swaths of meadow turn bright yellows with goldenrod and counterpointed by the mauves of the asters. The greens of summer are accented with the bright tones of butterflies and the reds of staghorn sumac. There is no subtlety to the colours of autumn, making it hard to be sad about summer’s departure. These wildflowers, plants, and shrubs are among those inextricably connected with two important migrations that take place at this time: Those of birds and Monarch butterflies. This time we’ll talk about the many birds that use the different habitats at Colonel Samuel Smith Park as a stopover to feed and rest, as well as some of the park’s resident species. Many young birds are still trying to grow quickly enough to be able to escape the cold winter weather; young goldfinches and cardinals are often heard into October, still begging for food from their parents. Juvenile raptors (hawks, falcons) and fish-eating waterbirds (herons, egrets, cormorants) are still learning to hone their hunting skills. Many warblers and vireos moult into drab winter plumage, making field identification difficult, and immature birds can add even more confusion. Immature American Goldfinch feeding on Spotted Knapweed. This Greater Yellowlegs was catching small fish in the pond in early November. A single Sanderling on the beach in September. Double-crested Cormorants begin leaving, and diving and dabbling ducks begin to move through. Diving ducks can form huge staging flocks just offshore, and take advantage of the good feeding in the harbour and the pond. A drake Hooded Merganser catches a hefty fish. November. A female Belted Kingfisher watches the pond for her next meal. This usually shy Adult Black-crowned Night Heron was patiently waiting for a fish just off the observation platform. This Cattle Egret, native to southern US states, Central and South America, turned up in fall last year and remaining for weeks, happily eating grasshoppers and fishing. This immature Yellow-crowned Night Heron, a rare visitor from the south-central U.S., attracted lots of birders in late August and September 2014. A juvenile Least Bittern, October 2014. This Peregrine Falcon was enjoying a bath in early November during a break from hunting. This is “Lucky”, who rules the roost at the Islington and Bloor nest site. This Osprey made a successful catch in the yacht harbour. Green Heron fishing on a foggy morning. This was definitely the Year of the Dickcissel in Ontario, an irruption year for a grasslands species that is one of the rarest breeding birds in Ontario. Many of the birds that have been spotted in the last month or so are attempting to breed, an encouraging sign. Dickcissels (Spiza americana) are songbirds that resemble brightly-coloured sparrows, but that heavy-duty beak gives it away as a member of the cardinal and grosbeak family. They earned their common name mnemonically from the male’s buzzy, emphatic song. They range through the prairies and grasslands of the central U.S. from Texas to Michigan and Ohio. Here in Ontario, Dickcissels are considered pioneers, occasionally colonizing the edges of their range, usually during drought years, and usually in the extreme southwestern portions of the province. This year, there have been sightings much further north and east of their range. Because of sharp-eyed birders and observers, they have now been spotted from the Kawartha Lakes region to Bruce County and all the way to Rainy River District. On July 7th, after spending the day birding and butterfly-ing in Carden Alvar Provincial Park, we decided to return through the hamlet of Fowler’s Corners near Lindsay in hopes of finding a pair of Dickcissels. In my 30+ years of birding, I’ll admit that seeing your target bird, especially a rare one, immediately upon stepping out of the vehicle is always a thrill–and indeed, the first thing we saw was the female Dickcissel perched at the top of a small tree at the edge of a sunken, grassy field, right beside the road, before flying into the tall grass. I eventually spotted her carrying nesting material to her under-construction nest hidden deep within the tall grasses. Shortly afterwards, the male flew to the top branches, threw his head back, and serenaded her (or declared his ownership of the territory, or both). We were able to observe and photograph both at almost eye level before moving on. Considering that I think my only previous image was from a sighting many, many moons ago–on deteriorating slide film–this was a privilege. During a visit to my favourite local patch (Col. Samuel Smith Park in the west end of Toronto) yesterday, I came across a small Northern Map Turtle (Graptemys geographica) sunning itself on a sunken log not far from the platform overlooking the pond. I have seen adult Map Turtles in the park before, usually on the far side of the pond and usually quite skittish, so this was a great opportunity to observe and photograph this one. As a young individual, no more than 9-10 cm in length, it was still brightly marked. This turtle is named for the markings on its shell, which look like contour lines on a topographical map. The head and legs have a pattern of bright yellow lines, with a yellow spot behind the eyes, and the carapace (upper shell) has an obvious raised “keel” or ridge along the centre. Other similar species found in the park include the native Midland Painted Turtle and, unfortunately, the non-native Red-eared Slider which is the most commonly released “pet store” turtle species in Ontario. They act like the neighbourhood bullies to our native species, often released by owners once they begin growing to 33 cm in length with a lifespan up to 30 years. Their habitat includes large lakes and rivers with slow-moving water and a soft bottom, and they require high-quality water that supports the females’ favoured prey, molluscs (females can grow much larger than males, up to 27 cm compared with 13 cm for the males). Because this species is not very common in our area, and because our reptiles and amphibians are experiencing global declines of 20 and 40 percent respectively, I’ve always considered it somewhat special. One way to help is to consider becoming a volunteer citizen scientist and submit your sightings, and not just the rare ones. One way you can do this by downloading the Ontario Reptile and Amphibian Atlas App on your smartphone–it’s also a digital pocket guide for all of Ontario’s reptiles and amphibians. Find more information at ontarionature.org; source material courtesy Ontario Nature; photos by Nancy Barrett. This was originally written as a guest post for The Pigeon’s Passage, the Lakeshore Interpretive Centre’s blog. As part of my current exhibit, Through A Lens, Brightly, I was asked to share a reflection on my approach to birding and to photography. I’m very grateful to the staff of the centre for hosting the exhibit and publishing this article. Just these two species alone have provided me many hours of serene observation and documentation of their life cycles: migration, courtship, nesting, raising young—all of these are available at close quarters. I’ve spent many lovely, meandering hours in the park, knowing that I’ll come across more treasures–a meadow full of dew-diademed Monarch Butterflies gathering for southward migration on a foggy morn, a Yellow Warbler feeding its newly-fledged youngster overhead; a Mink catching a fish right in front of me, a Snowy Owl gazing at me as she flies by.